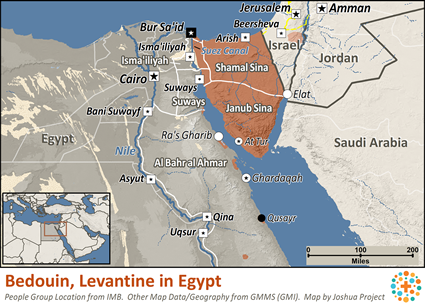 Several Bedouin tribes reside in Egypt, often occupying various oases in the desert areas. They lead a fairly harsh existence, with few amenities. Almost all are Sunni Muslim. 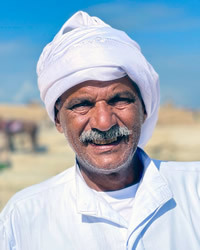 The Bedouin tend to be insular, separated from the communities around them. Creative means to connect to these people will be helpful. Scripture is not available in their language. Radio and television broadcasts of the Gospel message in the language of the Bedouin will be very useful, even necessary to reach these tribes. Pray for movements to Jesus to sweep through Bedouin families, permeating the group from within. There are few believers among these Bedouin peoples, but pray for those that will one day believe. Pray they will be filled with the Lord's Spirit, demonstrating love, joy, and peace. Pray for the Bedouin, that they will hunger to know the forgiveness and fulfillment found only through Christ.